Chökyi Wangchuk was born in 1584 in the Drikung area of Central Tibet. 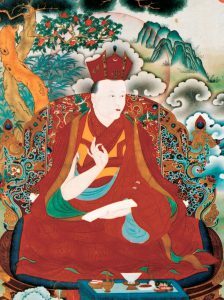 He was enthroned by the Ninth Karmapa as the Sixth Shamar incarnation and stayed close to him for many years, studying and receiving the full transmission of the Kagyu lineage. He became one the most renowned scholars of the time, in Sutra and Tantra, composing many commentaries. He became the Guru of the ruler of Central Tibet, Desi Tsangpa. He also travelled extensively to China and Nepal where he taught Buddhism in the original Sanskrit to the king of Nepal, Laxman Naran Singh, and other devotees. In Tibet, he rebuilt the monastery in Kampo Nyenang. He travelled to Kham, in eastern Tibet, where he recognised and passed on the lineage teachings to the Tenth Karmapa Chöying Dorje. He passed away in 1629, at the age of forty-five, in the mountain range of Helambu, Nepal.